The European Brain Council, together with its industry partners, is pleased to invite you to attend our upcoming full-day event, “Enhanced engagement through public-private partnerships: Sustaining therapeutic innovation to address patient needs”, part of the Value of Innovation series. The event will be held at The EGG Brussels on 21 November 2018 beginning with a welcome coffee at 10:00. 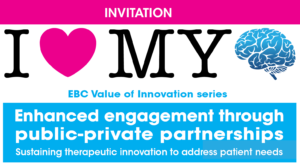 The event aims to provide the opportunity for individual EBC members and industry partners to showcase their latest initiatives to the broader EBC membership and key stakeholders, highlighting collaboration, innovation and multi-stakeholder engagement. Built around a number of keynote speeches, presentations and poster presentations, the aim for the day is to create a forum and foster dialogue focused on improving outcomes for patients in 3 key areas – Research & Development in Brain Health, Patient Engagement and Disease Awareness. 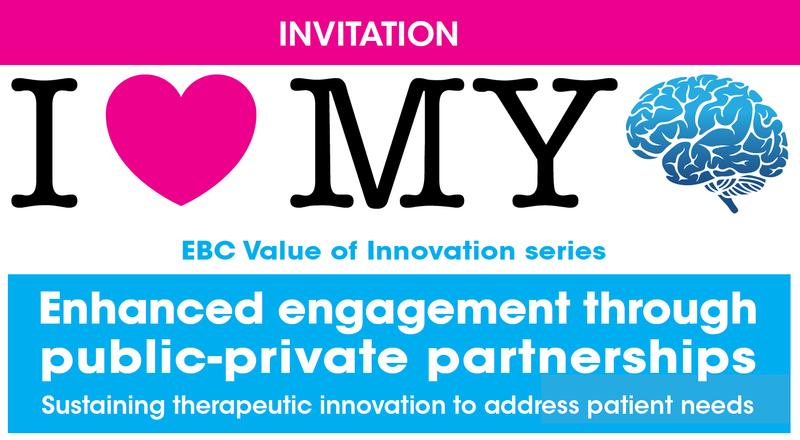 Confirmed speakers and chairs already include: Prof. Monica Di Luca (President, EBC), Dr. Pierre Meulien (Director, Innovative Medicines Initiative – IMI), Ms Sohini Chowdhury (Deputy CEO, The Michael J. Fox Foundation for Parkinson’s Research), Mr Andrew Powrie-Smith (Executive Director of Communications & Partnerships, EFPIA) and Prof. Guendalina Graffigna (Universita’ Cattolica Milan) – with many more to follow. The day will be divided into Keynote lectures, presentation sessions, interactive breakout session and a lunchtime poster session. Patients and patient organisation representatives are invited to contact EBC regarding support of travel and accommodation expenses for the event. To request support, please email Ms Stephanie Kramer at workshop@braincouncil.eu. Registration to attend is now open: REGISTER HERE.